The Zariba ring top fencing system uses an ornate ring top design and optional finials to provide one of the most attractive mesh fencing systems on the market. This ring top fencing system uses an attractive ring top and the mesh pattern that has been specifically designed to generate an aesthetically pleasing appearance for any perimeter. Manufactured with twin horizontal 6mm (Zariba 6) or 8mm (Zariba 8) wires ensures that the ring top fencing system is incredibly strong and can be used in areas where the system is likely to incur regular impact. The use of bright colours sets the fence off, making an attractive feature in any space. 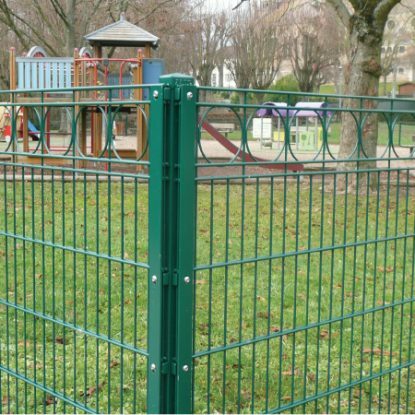 Zariba combines the robust Duo8 platform and a ring top design to provide an extremely durable segregation fence with a contemporary feel. Samples of Zaun Zariba are available upon request, to request your free sample please click here.